China's President Xi Jinping (R) shakes hands with Japan's Prime Minister Shinzo Abe during their meeting at the Great Hall of the People, on the sidelines of the Asia Pacific Economic Cooperation (APEC) meetings, in Beijing, November 10, 2014. The leaders of China and Japan met Monday at the APEC summit in Beijing in an attempt to reduce tensions between the two countries. While both sides agreed to talk about competing claims to islands in the East China Sea and anger in the region over Japan’s militaristic past, the issues at the heart of the conflict are unlikely to be resolved anytime soon. Japanese Prime Minister Shinzo Abe and Chinese President Xi Jinping met briefly at the Asia Pacific Economic Cooperation forum in Beijing Monday. Japan's Prime Minister Shinzo Abe shakes hands with China's President Xi Jinping (R) during their meeting at the Great Hall of the People, in Beijing, Nov. 10, 2014. They briefly shook hands for photographers and spoke behind closed doors for about 30 minutes in their first face-to-face meetings since coming to power. The talks are meant to symbolize new efforts being made by both sides to reduce the potential for military conflict following two years of high tensions. 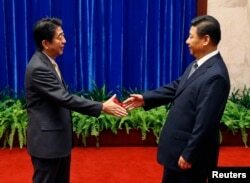 After the meeting the Japanese prime minister said both countries had begun to work toward reconciliation. He said it was a first step to return to the basics and improve ties to develop a mutually beneficial relationship. In a joint statement released Friday, the two sides agreed to "gradually resume political, diplomatic and security dialogue" and "make efforts to build political mutual trust." The agreement subtly navigates one of the major obstacles for talks: how each side describes the territorial disputes over a group of islands called the Diaoyus in China and the Senkakus in Japan. Japan refuses to acknowledge any challenge to its sovereignty over the islands, insisting they belong to Tokyo. Hosaka Yuji, a political science professor at Sejong University says the carefully worded agreement stating that “different positions exist” on the dispute was a compromise by both sides. He said China asked Japan to accept that the Senkaku islands are a regional dispute. But this part was not included in the agreement. Instead it ended in an expression saying there is a different perspective on this issue. Hosaka says Japan contends that it has made the best concession it can make, while China sees it as the second-best agreement it could get. Abe’s visit to a controversial World War II shrine that includes some Japanese war criminals also has contributed to the high tensions with China as well as worsening ties with South Korea. Abe made no public comment about whether he will again go to the shrine that he last visited last December. Robert Dujarric, the director of the Institute of Contemporary Asian Studies at Temple University in Tokyo, says the past two years of charged rhetoric has caused worries that a miscommunication or altercation could lead to conflict -- despite the damage it might cause. “Countries go to war even if it makes no economic sense. I mean we have a long history of this, if we look at world history. I mean the instinct to kill is much stronger than the instinct to make money,” he said. Dujarric says the talks between Japan and China could produce a better crisis management communication system to deal with incidents that may occur in the disputed region. But the professor says the disputes with Japan are merely one example of Beijing’ more forcefully asserting its territorial claims throughout the region, drawing worries from neighboring countries as well as the United States. “Fundamentally there is clash between the United States and China. Japan matters because Japan is a U.S. ally but the core challenge is not to deal with China versus Japan, but with China and the United States,” he said. U.S. officials regularly say they welcome China’s rise as a global power, and have no intentions of trying to contain Beijing. VOA News Producer in Seoul Youmi Kim contributed to this report.